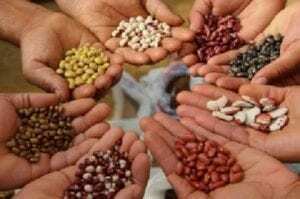 What Do You REALLY Know About Seeds…? The saying ‘good things come in small packages’ is best exemplified by one simple word: SEED. Every spring, whether intentionally planted or by volunteer, the humble seed, bathed in water and nestled by soil, cracks in the sunlight to reveal the gift of life. From that seed-burst into plant life, countless others are nourished. For humans, the seed represents a 12,000 year food legacy, that sadly, most take for granted. As one of the most critical issues of our time, the seed industry is NOT so simple, and the loss of seed diversity affects us all. This tiny package has a story, a story that is critical to every being on the planet who eats food. From the award winning Collective Eye Films, comes the movie SEED: The Untold Story. The newly renovated Dairy Arts Center is hosting this environmental documentary, November 30 through December 3. Boulder friends, please don’t miss this film featuring Dr. Jane Goodall, Vandana Shiva, Winona LaDuke, and Andrew Kimbrell. Order tickets here. Welcome to Ecoscape’s blog, a place where we plan to share sustainable ideas, gardening tips, environmental issues facing our local community, permaculture ethics, and landscape design inspirations. We are also passionate about plants! So you will find posts on specific herbs, edible and flowering shrubs, native perennials, ornamental grasses, trees, and even turf grass and weeds (yes, turf and weeds are plants too!). 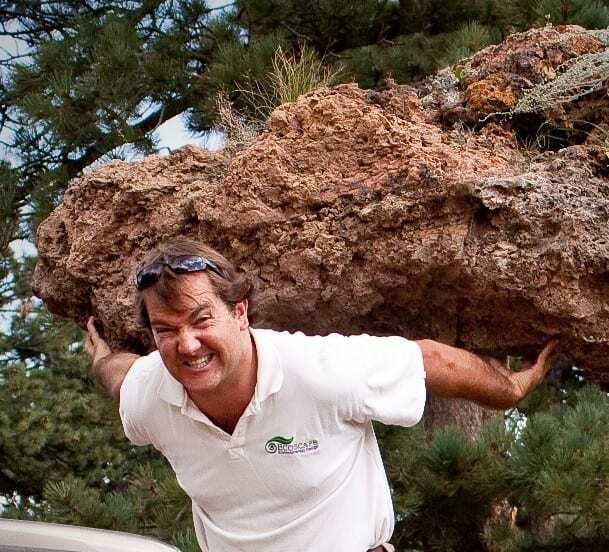 Bill Melvin, the one doing the heavy lifting with the boulder, is our company founder and managing director. Since 2000, Bill has developed Ecoscape Environmental Design to be a full-service landscape company with a strong ecological focus. 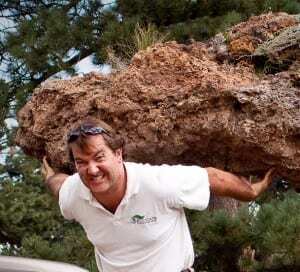 It’s no accident that big boulder is on his shoulder, environmental responsibility is a weight he carries seriously. He’ll step in to share some of the projects he’s working on, and his perspective as a father, permaculture designer, and community business leader.